Be the first to share your favorite memory, photo or story of Madge. This memorial page is dedicated for family, friends and future generations to celebrate the life of their loved one. Madge Louise Bowman-Burch entered her earthly home July 12, 1932, in Aurora, Missouri. 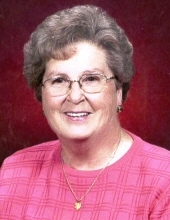 God’s angels took her to her Heavenly home February 1, 2019, while she was residing at the Cassville Health Care and Rehabilitation Center. Madge was born to Lela (Shipley) and Jay Browning, the 4th of their 5 children. She graduated from Verona High School. Madge became a successful book keeper and office manager. Upon retirement she became a Mary Kay Beauty Consultant for over 10 years, earning many top sales awards. On May 30, 1952, Madge married Jim Bowman. They were blessed with two girls Melisa and Julie. Madge was a member of the Order of Eastern Star-Sarcoxie, became a District Deputy Grand Matron and became a lifetime member of the Order of Eastern Star. She was a member of the Aurora United Methodist Church, the Aurora Community Hospital Auxiliary and the Nu Kappa Chapter of Beta Sigma Chi Sorority. On August 18, 1979, Madge married John Burch. They spent most of their years together traveling, eventually returning to Aurora to be with family. John passed a few hours after Madge on the same day in their home. Madge was preceded in death by her parents, sisters, Viola (Nolan) Black; Marie (Ralph) Neimeyer; her brother J.D. (Leila) Browning; and her husband Jim. She is survived by her daughters, Melisa Bowman of Aurora and Julie (Jerry) Wendler of Aurora; her brother Orlin (Janet) Browning of Aurora; three granddaughters, Kari (Brad) Boettler, Kassie (Danny) Nixon and Jill (Rudy) Garoutte; seven great-grandchildren, Keaton Smith, Evan & Sikenan Boettler, E.J. McCray, Kaylann Bowman, Addilynn Garoutte and Gracie Nixon, and five nephews and many other relatives and friends. Visitation will be held from 6:00-8:00 p.m. on Tuesday, February 5, 2019, at the Crafton- Cantrell Funeral Home in Aurora. Her life will be celebrated at 2:00 p.m. on Wednesday, February 6, 2019, at the funeral home. Burial will follow at the Spring River Cemetery. In lieu of flowers, donations can be made to Hospice Compassus or Cassville Health Care and Rehabilitation Center activity fund with checks made payable to Crafton-Cantrell Funeral Home. To send flowers or a remembrance gift to the family of Madge Louise Burch, please visit our Tribute Store. "Email Address" would like to share the life celebration of Madge Louise Burch. Click on the "link" to go to share a favorite memory or leave a condolence message for the family.